The seven ‘Changing Face of Consumerism’ articles I ran on MySpace in 2008 and 2008 all shared a common theme, namely lamenting the sad decline of the real – both in media and commodity, with ‘reality’ television being a pisspoor ersatz approximation of any reality I’ve ever known, and ‘real’ shopping experiences being slowly subsumed by the virtual marketplace. Don’t get me wrong, I’m all for progress, and have long been a big fan of on-line shopping, being one who doesn’t cope well with crowds or endless hours of pavement-pounding in search of goods, but by the same token, I’m a strong advocate of consumer choice. Despite what the global marketplace on-line tells us, we as consumers do not have infinite choice, not least of all because while some niche outlets fare well on-line, many have gone to the wall because the same kind of corporate giants that slowly erased all of the small independent stores from the high streets of each and every town have steamrollered the little on-line traders out. As city centres everywhere become identikit clones of anywheresville, so our sense of location becomes diminished: the only thing to differentiate, say, Leeds from Lincoln, isn’t the choice of shops, but the size of each branch, and after a mooch round M&S, Boots, Game and HMV, stopping for a uniform coffee in a Starbucks or Costa before going on to… well, it doesn’t matter. I mean it really doesn’t matter where you are, the experience is pretty much the same. Fine, so you know what you’re going to get, but the experience of discovering a little specialist shop tucked away somewhere is radically different and appeals to a whole range of senses. However hard Amazon try to replicate the browsing experience of specialist independent book and record stores with features like ‘look inside’ and the song snippets you can listen to, in addition to the list of recommendations based on what you’re looking at and what other shoppers have also purchased or viewed that functions as a mimesis of the friendly and enthusiastic guy behind the counter who just loves his books or music and knows everything there is to know, like a living, walking encyclopedia, it just isn’t the same. There’s no substitute for browsing. 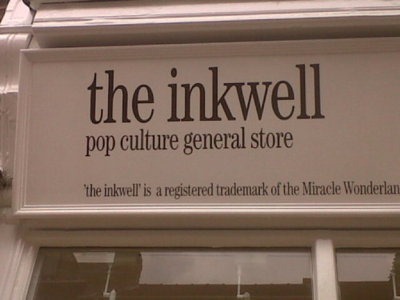 And so it was that I was practically skipping when The Inkwell opened in York a few weeks ago. A little shop stocking secondhand books, records (with a few selected new titles), CDs and cards, it’s the kind of shop you used to drop into, rummage around and find something wonderful you didn’t even know you wanted. The owner, Paul Lowman, is clearly an unashamed enthusiast first and a businessman second, and while such a venture is the kind that will never make him rich, and would make many lenders and entrepreneurs alike squirm in discomfort, it’s a shopper’s delight. Perhaps not surprisingly, The Inkwell is aimed at a niche market (by which I mean discerning shoppers: Paul’s philosophy is according to the website, “COOL STUFF FOR ALL!” Popular Culture is about democracy – inclusivity, not exclusivity) specialising as it does in books on music, film and pop culture, with sections on the Beat Generation, Art, Philosophy and a noteworthy – not to mention impressive – selection of pulp paperbacks, all in remarkably good condition (yet reasonably priced, with titles marked up at between six and ten quid). The vinyl, too, is all in great nick, and the range, though limited, is all about quality and catering to a particular kind of discerning alt/hipster customer. There’s no mainstream pap to be found on the racks: instead, there are sections devoted to Garage, Psych, 90s Indie, Spoken Word / Comedy, and even Burlesque. Yes, if you want the kitsch sleaze of yesteryear, then the range of sexploitation titles in both audio and written media is exceptional. It’s a tiny little place, made all the more cramped by there being a pair of school desks in the middle of the room, upon which a choice of books are casually laid. It’s all about the browsing experience (they serve coffee too), and an eclectic mix of music is spun – at high volume, and all on vinyl, naturally – on the turntable in the corner by the counter. Of course, it’s simply one’s man’s vision, one man’s obsession made manifest… but what’s wrong with that? But equally, why should a shop such as this succeed in a climate where major chains are going to the wall? The answer, I believe, is simple. In attempting to appeal to everyone, the major chains ultimately cater for no-one. In aiming to cover a vast market based on some kind of assumed generic average consumer and broad populism, the chains become Xerox copies of one another: reliable, perhaps, but ultimately forgettable and wholly impersonal. A shop like The Inkwell isn’t about conquering the world or trying to cater to all tastes: it knows its market and knows it well – because by being the shop its owner wants it to be, it’s catering for like-minded individuals (there’s that word again!). It’s unique in every way, and every item in stock is essentially a one-off. It has the personal touch and is memorable. And that’s why it has a better than average chance of success. So, on the opening day I left with a brand new hardback copy of Brion Gysin: Dream Machine (a bargain at a tenner given that it retails at £25), a read but respectable copy of The Dark Stuff by Nick Kent (£3) and a vinyl LP – a copy of Fade Out by Loop, again in top condition (EX as Record Collector would have it), for a fiver. I returned this week and was pleased to see some of the stock had gone and new stuff had taken its place, meaning I was able to add a copy of the original 1971 Olympia Press edition of S.C.U.M. Manifesto by Valerie Solanas to my library. The tenner asking price was more than fair, especially given the condition. Does The Inkwell represent the vanguard of the counter-revolution in the world of retail? Perhaps not, but I’d like to think that other independent stores will begin to pop up, not just in York, but in every city, and soon. It’s unlikely that this is how the economic situation will be recovered, but being able to rifle some good books and records in a pleasant environment certainly makes these dark times a lot more bearable. The Inkwell Online is cool – www.ink-well.co.uk – but not nearly as cool as being there. Previous Post Too Busy to Blog! i have not seen this shop but i completely agree, i hope it lasts! Me too – we NEED shops like this! And if you’re ever in York, do check it out!